I mentioned last month that I was returning officer in the selection of the Scottish Liberal Democrat candidate for the new North Angus and Mearns seat for the 2011 Scottish Parliamentary Election. Nearly 40% of the new seat comes from the current Liberal Democrat West Aberdeenshire and Kincardine seat with its very active LibDem membership and councillor base, so is promising territory for the Scottish Liberal Democrats. From a Liberal Democrat perspective, the new seat is also helped by the fact that in the “non Mearns part” that is not in the current West Aberdeenshire and Kincardine, there is also very active team of Liberal Democrats, including Councillor David May in Montrose. The party is pleased to announce that Sanjay Samani has been selected to contest the North Angus and Mearns seat at next May’s Scottish Parliamentary Elections. 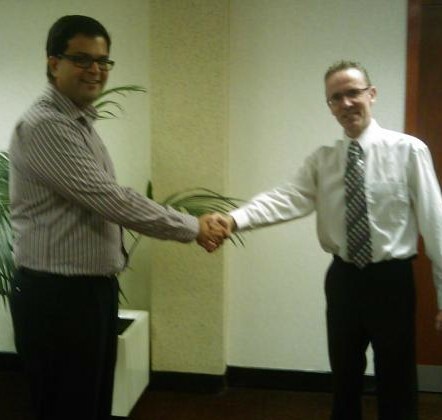 The photo (above) is of me congratulating Sanjay at the announcement of his selection.